I haven't been fishing much lately that's why NO reports coming from this direction, but none the less we have one now. Went to the Great lake on Saturday with some mates 3 boats in total and 6 fishermen, upon arrival we decided to make some fun out of the long weekend and made it a little competition between all the boats. Team Woodberry flew out of the blocks on Saturday afternoon boating 2 nice Brownies in the first half an hour by 6pm and ended up with another 2 a bit later by 7.30, netting 4 very nice Brownies all in very good condition 2 actually carrying fat inside them. I took my mainland mate (Kevin Wilkinson) to the Great Lake yesterday, joined by Bailey and Phil Zanetto. 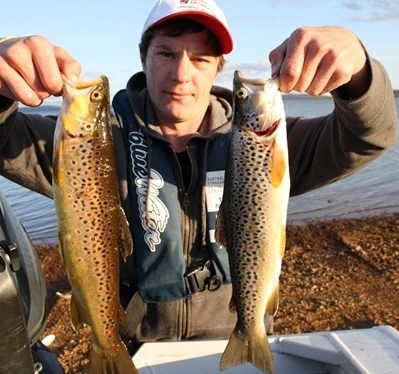 We were hopeful of some good "Shark fishing", ..(polarioding trout in windlanes). Phil caught one, we never saw a fish. The BBQ was good though. Bailey & I decided it was about time we got into a bit of dry fly fishing, so with a good forecast we decided to spend a few of hours up at Cramps Bay at Great lake. Werrived around 12pm and fished till 5pm, was tough going. There were plenty of gum beetles on the water, but not too many taking off the top; we did a lot of running around looking for likely spots. We had a trip to the highlands on Saturday arvo and fished Great Lake. 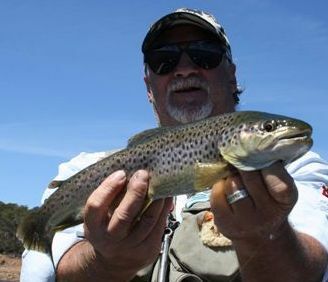 Sunday saw us at Arthurs Lake with my old fishing mate Roundy... Below is the wrap up of the weekend. We arrived on Great Lake around lunch time, conditions weren’t too bad when we arrived but deteriated as the afternoon went on, it got very cold and windy. We stuck it out for a couple of hours for one brown caught by Roundy around the 3lb mark and a couple of misses on the softies. With a big wish list for a great long weekend planned my bubble soon got burst on Friday when I checked the 4 day weather forecast. Arriving at the Great lake around 2pm finding a reasonable southerly wind coming straight up the lake and most of the fish on the fish finder at around the 7 metre mark I guess due to the barometric pressure on a down ward trend also found they weren't very hungry tried every colour of the rainbow to catch only 1browny in good condition 1 1/2lbs and a very shabby rainbow should have been over 3lbs bet was lucky to get 1 1/2lbs on the scale. I don't why this fish was in so poor condition but over the weekend talking to another angler he had caught one as well just as poor. I decided to have a look up at Elizabeth Bay today in Great lake. My young offsider, Shane from work has been at me to take him trout fishing for ages so I decided to take him up for a fish, Bailey couldn't be with us as he was too busy down at St.Helens fishing with my brother Paul and his son Nathan. They have been catching some nice salmon, bream and trevally I will try and get some pics for you later on. Bailey and I thought it was about time we had a fish. It’s been three weeks since we wet a line, so off we went to Cramps Bay to put the boat in. We got there around 11am and got back to the ramp around 4.30pm. The day was mostly cloudy with a few sunny periods, with light wind coming from the south east, turning around later in arvo from the north. I headed up to Cramps Bay (Great Lake), with my boy Jared this morning. Left home around 6am and was on the water & fishing by around 7.15ish. 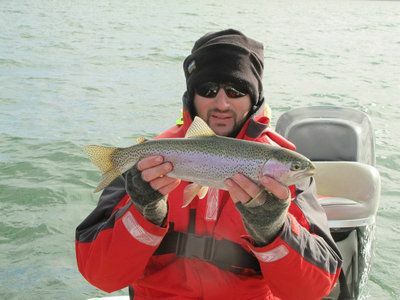 Using Yep black n gold flappers we landed 7 trout, most being browns with the exception of a lone rainbow. We fished on along the western shore using 1/8th jig heads in around 1.5 to 2 metres of water. Retrieves were very slow,... keeping the plastic along the bottom for as long as possible. Not much snow left up there at the moment and fish (when cleaned), were extremely pink in colour. I went up To Great Lake on Friday night to catch up with a few mates and to get ready for an early morning mission on the trout, opening morning. We had 12 guys staying at the shack we rented... and 5 boats in tow. Most of us made it out onto the water around 7am and myself and a mate (Pat), headed around the shore lines of Becketts and Todds corner. We fished mainly hard bodies for the first few hours of the day, using Cultiva minnows and Jackal colt minnows in black and gold colours. As it turned out, we had an impromptu Presidents club outing at Cramps Bay (Great Lake) today. A great day was had with good company, even though, "as expected"... it was a bit on the cool side.